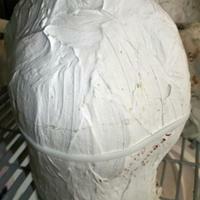 Two piece plaster mother mold with inner rubber mold and plaster core . "Oriental Girl" written on mold. This is a mold for Chinese Actress. There is a plastic zip tie banding the mold together.